There’s a rumor floating about the world, that nowadays, everyone speaks at least a little English. They say that if you are in a foreign country long enough, eventually, out of the blue, you will see someone you are acquainted with. This is the poster. Source unknown. Lindsey points out the coolest part of an English morning – English breakfast! I remember walking down that one, gritty asphalt road to the Ghanaian market that sold everything. It sold everything, but I don’t know who to – it seemed like everyone around me had any money to buy anything. I guess because they would always ask us for money, I assumed they didn’t have any of their own. I’m also sure that the market stall owners inflated their prices for us too. But even so, everything was cheap to begin with. I really don’t know who was buying those things in the market, but somehow, profit was made. People cooked things in the market. I often bought roasted sweet corn from a small, thin boy with skin the color of cocoa powder, sitting behind a makeshift grill. He wore orange flip flops. People cooked things using flames, and coal – that’s what made the smoke, made everything smell like a camp fire. Sometimes you could get an omelette; if you were “on the go” they found a plastic bag for you and slid it inside. Everyone cooked over an open fire in Ghana. Microwaves don’t exist. There are no stoves or ovens, except those made from clay. You might be able to find a hot pot or a small range, but why bother? You can boil anything you need over the flames. Everyone else does, and it saves on electricity. In Slovakia we made a fire to commemorate special anniversaries of Czechoslovak history. An eternal flame, supposed to signify the determination of Slovaks during the troubling time of Communism, but with this generation, no one really cared about it so much. We roasted Eastern European marshmallows over it and toasted bread and onions on the logs. My favorite sweater, the sweater I wore all the time in Slovakia, always smelled like singed wood. My favorite sweater kept my favorite smell. We stayed in the Jizera Mountains during our last week in the Czech Republic, at a small pension made up of two cabins. It was bare bones but comfortable – the toilet gave off a raw sewage scent but what did you expect from a rural, former Communist town? The whole complex was heated by wood burning stoves. I sat near the largest stove, in the dining room, uploading four months of photos onto Sarah’s computer. She was making a slide show. While everyone else is Skyping or calling home, I go back to my hotel room. I was immersed in the culture of Eastern Europe from the start. The boxy furniture and plastic lampshades, hidden by Belle Époque architecture, the cobblestone streets leading up to flouncy staircases, enchanted me. Instantly in love with Prague, I looked at the present instead of predicting my future. The room is quiet and smelled slightly of damp carpet and cedar. A bedside light is on in the corner, but the sun is slowly setting outside. 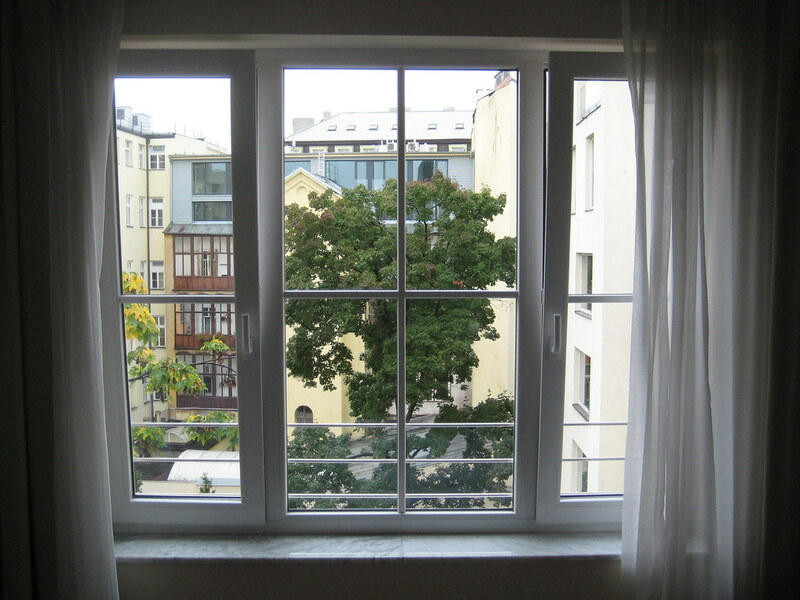 I open the six-foot window – it is the kind of window that is hinged on one side and held closed with a clasp on the other. Sort of an old-fashioned window, really. It opens outward into the city, and I feel the warm, clean air rush in. At first, I merely stand leaning on the edge, studying my surroundings. A lavender sky backdrops the cream-colored Czech buildings, bright green trees and muted gray of the streets. It is perfect. They say that Prague is the fairy tale city, and I will never argue with that. Because at that moment, I truly feel like a Bohemian princess. Eventually, I sit on the edge, my knees drawn up to my chest. I can’t stop smiling and feeling incredibly at ease. Fear of falling does not cross my mind as the scene serenely shows me that peace and quiet truly can exist in this world. What more can a person possibly want other than this? When else will I ever get to indulge in such a moment? I looked at the present, instead of predicting my future. The first time I ever flew on an airplane by myself was shortly after I had turned 18. I was going to Ireland, to do volunteer work, the nature of which was a mystery to me still. I was scared, but determined – I couldn’t swim across the Atlantic, and a plane was the only way I’d get to see the world. So I went through the motions – ticket agent, baggage check, metal detection, pre-boarding and finally, strapping myself into adventure. My flightmate was an older gentleman, with snow-white hair and a bushy mustache. He wore all black with a square of white peeking out at the neck. He was a priest. He struck up conversation first. “I have an extra eye-shade, if you need it,” he offered to me a black eyeshade made of silk. But I was already prepared. “Thanks, but I’ve got my own,” I revealed a neon-yellow sleep mask. The words “Cat Nap” were written across the top. It was from a goodie bag I received on my flight to London a mere six months before. But that was a trip taken with about fifty students from my high school. First trip abroad, but not alone. So we began talking. He was visiting a friend’s parish in Shannon before heading to Dublin and then flying back home to take a sky-box train across Canada’s natural terrain. He lived in Sayville and was retired, but still filled in every now and then at the church in his area. It put me slightly at ease – there’s no way God would cause a plane crash carrying a nice, old priest as a passenger. But even so, if the plane went down, I could just grab on to him as he shot up into Heaven. Fortune, however, smiled down on me even further. True to form, my knuckles whitened as they clenched the armrests for dear life. Flying diagonally in the air is such a strange experience, unnatural and very upsetting to me. I felt a bump and heard some mechanical noises. “Don’t worry, that’s just the wheels going into the shaft,” he explained. Some whirring sounds. He explained those as well. He explained everything to me. Every utterance and every shift – my fears were quelled by his guidance. In minutes, we reached a cruising altitude and the stewards began serving refreshments. We both fell asleep. A sudden jerk woke me. I involuntarily grabbed my flightmate’s arm. Startled, he woke up, asked what was wrong. “I felt something bump,” I said, my breath quickening. And then, he asked me. The entire time we’d been sitting together, we had managed to avoid the whole religion conversation. It intimidated me, at first – the priest from my High School was so devout that all he seemed to talk about was God and Jesus and religion and what it meant to us. It was uncomfortable. The fact that this priest had hobbies and a life outside of the church was something new to behold. He’d never even asked me if I was Catholic. I sat silent for a moment. “I guess so…” I finally admitted. He rambled on for a few more minutes. Looking back on it, I think he did it to keep me from waking him up again. We reached Shannon airport at approximately 6:17am. The priest and I parted ways, exchanging contact information. I wasn’t convinced I wanted my third time on an airplane to be one that did barrel rolls and nose dives. But I said I’d let him know, and that I did have friends who liked that sort of thing. My bus to Kilarney wasn’t due to arrive until 10:00am. As I sat on the polyvinyl chairs of the airport, waiting, I still couldn’t believe my luck as I flew over that vast ocean. Sometimes, I wish I had had the courage to fly on that trick plane.